USAGE GUIDELINES: Add 1 scoop (25g to 30g) to a large glass of water, juice, milk or other liquid. Stir with a fork or use a blender to mix. Use before exercise, after exercise or simply as a tasty protein shake during the day. 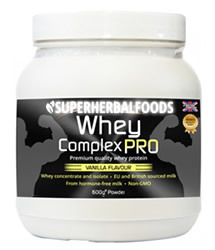 Whey Complex PRO is a premium whey protein supplement, derived from a blend of high quality whey protein concentrate and whey protein isolate. Only the highest grade hormone-free milk, sourced from EU and British grass-fed cows, has been used in this formulation - no GMOs. As well as providing an excellent nutritional profile, we have ensured that using Whey Complex PRO is a tasty, hassle-free experience. It comes in two popular flavours (chocolate and vanilla) and can simply be added to water, juice, milk or any other liquid for a tasty protein shake. Can taking the right protein supplement enhance your performance, while supporting your health? There’s compelling evidence that it can. Protein is essential for normal growth, cell repair and the production of hormones, immune cells and muscle. For a number of years now, scientists have been investigating the potential health benefits of a particular type of protein: whey protein which is derived from milk protein. Unlike whole milk, whey protein contains very low levels of fat, lactose (a milk sugar that can be hard to digest) and no other undesirable ingredients (provided the protein is of premium quality and from a reliable source, like Whey Complex PRO). Whey is often promoted as the “perfect protein” for building strong muscles, because it has an excellent amino acid profile, is low in fat and is easily absorbed by the body. It is therefore extremely popular with bodybuilders and athletes, because they place high demands on their bodies and they need additional protein to help maintain existing muscle and build new muscle. Muscle protein is in a constant state of turnover in the body, being broken down and rebuilt - hence the need for regular intake. It provides an excellent nutritional profile and the correct muscle-building ingredients for effective and improved results. We’ve packed each serving full of our unique protein blend of whey protein concentrate and isolate, to provide the user with everything they need to build muscle. To gain muscle mass, increased calorie intake is also important. Whey Complex PRO contains up to 118kcal and provides up to 4.2g of carbohydrates per 30g serving - ideal support for the daily diet in the form of an easy-to-prepare and great-tasting protein shake. Shaping and toning - it’s not just for men! The protein powder industry has been dominated by male consumers for years, but more recently, there has been a huge surge in demand from female consumers. The fact is, women also need protein, and this requirement is even more important when they are on a diet or exercising. This is because protein can both support their health goals and, in many cases, help to improve and speed up outcomes. For example, by helping to speed up metabolism, assist with fat burning, decrease appetite, support high energy levels and promote cell repair, contouring and toning. While more and more women are recognising the importance of high quality protein supplementation, it is still up to you to educate your female clients on the fact that whey is not only useful for ‘gym-fanatic’ men! Whey protein exists in 3 main forms: isolate, concentrate and hydrolysate (where the whey isolate undergoes additional processing). Can't decide which one to try? We’ve included both concentrate and isolate in our formula! Whey concentrate and isolates go through a process to remove most of the carbohydrates, fat and lactose from "regular unprocessed whey" derived from whole milk. This process is called "ion exchange" or "filtering." Both result in an almost pure protein. A "concentrate" is 80% protein and an "isolate" is 90% protein. There is no other real difference between the two, except that isolates go through an extra filtering step to remove more fat and carbohydrates. The protein quality is identical.